FUE or Follicular Unit Extraction is a less invasive form of hair transplant harvesting that requires no scalpel or stitches in the donor area (back of the scalp) and leaves absolutely NO linear scar. Recovery is dramatically more comfortable, more rapid, less restricted than traditional old-style invasive “strip” harvesting. Because there is no linear telltale scar to hide, modern short hairstyles can be worn without fear or concern of detection that a procedure has been performed. Since ONLY natural follicular units (groups of typically one, two or three hair follicles) are harvested, when a surgeon correctly applies these grafts artistically in the hairline, crown or other areas, what FUE offers is the most natural, least detectable hair transplant available. 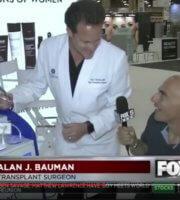 Internationally renowned minimally-invasive FUE hair transplant pioneer, Dr. Alan J. Bauman, M.D. was invited to CBS Early Show LIVE in New York to discuss the latest tool for hair follicle harvesting called NeoGraft. NeoGraft FUE is a less invasive alternative to traditional old-style “strip” or linear harvesting of hair follicles. Initially trained in hair transplantation in the 1990’s, Dr. Bauman always thought that there was a better, less invasive way to harvest hair follicles for transplantation than the traditional strip-harvest approach. Dr. Bauman has performed FUE or Follicular Unit Extraction, with a no-linear-scar approach to hair transplantation since 2002 and designed the first commercially-available hand-held manual tool available to surgeons to help surgeons perform FUE hair follicle harvesting, called the “Bauman MINDEX.” In 2007, Dr. Bauman became the first ABHRS-certified hair transplant surgeon in North America to routinely use the NeoGraft device for FUE harvesting. In 2009, he hosted the first ever NeoGraft FUE Live Surgery Workshop in Boca Raton, FL attended by dozens of physicians and other professionals in hair transplantation. In 2010 he became the first surgeon to demonstrate the NeoGraft at the ISHRS Orlando Annual Live Surgery Workshop. Board-certified Hair Transplant Surgeon, Dr. Alan Bauman and his surgical team has transplanted nearly two million FUE grafts since 2002 and is a frequent lecturer on the topic of FUE Follicular Unit Extraction methods of transplantation. Dr. Bauman has trained hundreds of doctors in the proper set-up and use of the NeoGraft device and FUE techniques to achieve superior results for their patients. Dr. Bauman is certified by the American Board of Hair Restoration Surgery, an accepted member of the prestigious International Alliance of Hair Restoration Surgeons and is recommended by the American Hair Loss Association. He is also a Fellow of the International Society of Hair Restoration Surgery and is a frequently-invited faculty member at major international medical conferences. See Dr. Bauman’s NeoGraft FUE results. See more NeoGraft FUE videos. Read more about NeoGraft FUE and read NeoGraft FUE FAQ’s. NeoGraft / FUE Hair Transplant FAQs – Patient Info from Bauman Medical Group, P.A.